A report surfaced yesterday (Oct. 27, 2016) indicating that three of Anthony Pettis’ cars had been set on fire and burned in his driveway at his home in Milwaukee, Wisconsin. Today (Oct. 28, 2016), the former UFC lightweight champion commented on the horrible situation via his official Instagram account. I am a fighter. I won’t be defeated by this. I am also extremely confused and saddened by the events that occurred. I am grateful that no one was harmed by this cowardly act. My life as well as my loved ones were put in danger. I cannot understand why someone would want to hurt myself or my family. I will do everything I can to ensure that we find out who committed this crime and that they are prosecuted to the full extent of the law. I’m constantly defending my choice to stay in this city. Regardless of the crimes that have been occurring lately, this is my home. I really hope the city that I rep has my back on this one and helps by reporting anything they know about this. 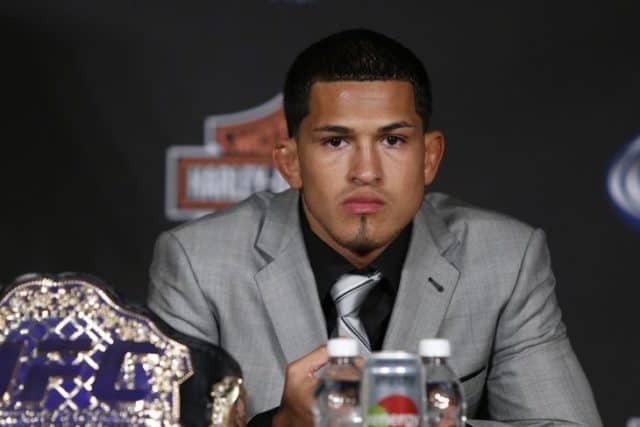 #teampettis #250k???? After dropping two straight bouts at lightweight, the ex-champion recently dropped down to 145-pounds where he scored an impressive victory over then No. 6-ranked Charles Oliveira last August. Pettis is now set to take on No. 3-ranked surging contender Max “Blessed” Holloway at Dec. 10’s UFC 206 from Toronto, Canada with a potential title shot on the line.